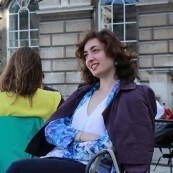 Born in Tbilisi, Georgia, Tamar Koplatadze is currently working on a PhD at the University of Oxford. Her research focuses on post-Soviet women’s writing and film. She completed her masters in French Literature and Culture.